Here are three tips with examples of companies that are getting it right when it comes to excellence in customer-centricity. TGI Fridays, recently earned a top spot in the Dunnhumby Customer Centricity Index which noted that when it comes to restaurants, "experience matters as much as the food." TGI Fridays was recognized for its major differentiator, loyalty. TGI Fridays was also honored in the Loyalty360 Awards. "Fridays is intently focused on ... meeting the needs and desires of our most loyal fans. [We use] member data and insights to enable relevant, multichannel communications that build and sustain engaged relationships, support brand activations, drive incremental traffic, and create brand advocacy... We develop, test, analyze and launch new program benefits and concepts that meet our guests' needs... Depending upon the marketing program, we may use behavioral and personal profile data to tailor messaging content, copy tone, offer strategy, channel, and contact frequency. Our goal is to deliver memorable guest dining experiences, reward members for their loyalty, inspire social sharing, and create brand fans." The company's Give Me More Stripes loyalty program not only offers rewards but also has a social component that states, "In here there's plenty to talk about," and gives fans a platform to share their experiences. "[Consumers are] more inclined to spend with businesses they feel good about... consumers will give more money to the businesses they feel emotionally connected to...the vast majority of customer buying decisions are influenced by emotional factors." Noting an emotional connection to their web experience, Norwegian Cruise Lines was recognized by Key Lime Interactive's Comprehensive User Experience Report for their "Consistently positive emotional experiences ... the site significantly outperformed its competitors' in terms of time spent on the site [which] increased the brand's perception as 'entertaining', 'appealing', 'fun', and 'family-oriented'." ANZ Bank, a top-four international financial services firm, was the recipient of the International Customer Experience Award for "[showing that] service, satisfaction and ROI can improve by listening to customers." "Our real-time customer feedback tool... allows us to track the [customer] journey, and then make improvements to our customer experience programs. By collecting insights and feedback at key steps, we've improved our conversion rates, responsiveness and communication processes in every way." Up to 48 percent survey response rates - more than 10 times the industry standard. When you create compelling and competitively differentiating customer value, retention will increase dramatically. Use customer behavioral data and voice of customer insights to drive development of new engagement programs. Use multiple channels and multiple ways of gathering customer insights. Then, tailor messaging around the customer's journey at every stage. Cultivate fans that want to have a relationship with your brand. Understand the emotional reasons that customers will identify with your products, services and overall brand. 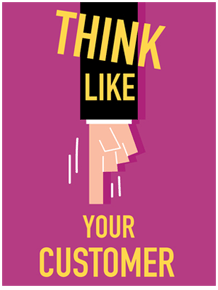 Being customer-centric in your marketing means that you recognize your customers as more than a transaction. You take the time to get to know why they choose your company and then put in place strategies to nurture trust and deliver meaningful brand experiences designed to engage and retain. Ernan Roman is president of ERDM. ERDM conducts Voice of Customer (VoC) research to identify high impact Customer Experience strategies. Inducted into the DMA Marketing Hall of Fame due to results clients achieve with ERDM's VoC research driven strategies. Clients include IBM, MassMutual, Microsoft, NortonAntivirus, QVC and NBC. Roman is the author of Voice of the Customer Marketing and of the Huffington Post published blog, Ernan's Insights on Marketing Best Practices. Named by the Online Marketing Institute as one of the "2014 Top 40 Digital Luminaries" and by Crain's BtoB Magazine as one of the "100 most influential people in Business Marketing".